The versatile design of the Delta Q 72 volt Battery Charger 72v 12 Amp 912-7200 provides you with flexibility and superior battery charging performance. Any Delta Q QuiQ battery charger is usable on or off-board your EV. This Gem Car (2005 and Up) battery charger can has optimized charge profiles for lead acid, AGM and lithium-ion batteries. All QuiQ Series chargers share an identical mechanical design and IP66-rated ingress protection. They are also quite easy to deploy across machine platforms depending on the needed power output and voltage requirements. This Delta Q QuiQ battery charger operates on any single-phase grid worldwide with a 93% peak efficiency. This Golf cart charger can store up to 10 lab-validated charging profiles for specific brands of batteries to help assist you in achieving battery charging flexibility. Please Note – Due to Worldwide usage this product does Not Include AC Power Cord – Please See linked products and choose the one that is used in your area of the world. The versatile design of the Delta Q QuiQ Gem Car Battery Charger provides you with flexibility and superior battery charging performance. The Delta Q QuiQ 72 volt battery charger is usable on or off-board which comes in handy depending on the application you are looking for in a new battery charger. The all new Delta Q QuiQ Gem Car Battery Charger contains up to 10 optimized charge profiles for lead acid, AGM and lithium-ion batteries. All QuiQ Series chargers share an identical mechanical design and IP66-rated ingress protection. They are also quite easy to deploy across machine platforms depending on the needed power output and voltage requirements. This Delta Q QuiQ Battery Charger operates on any single-phase grid worldwide with a 93% peak efficiency. This Golf cart charger can store up to 10 lab-validated charging profiles for specific brands of batteries to help assist you in achieving battery charging flexibility. Delta-Q Technologies provides power management and power conversion solutions that improve the overall performance of your electric vehicle. Delta-Q Technologies is a leading provider of battery charging solutions that improve the performance and reliability of electric drive vehicles and industrial equipment. The Delta Q QuiQ 72 volt battery charger is available in several power levels that are appropriate for your golf cart batteries specifically. The Delta Q QuiQ line of Golf Cart battery chargers are highly reliable with charging quality that is bar none. Combine that with the ease of integration and you have a world leader in Golf Cart Charger technology. 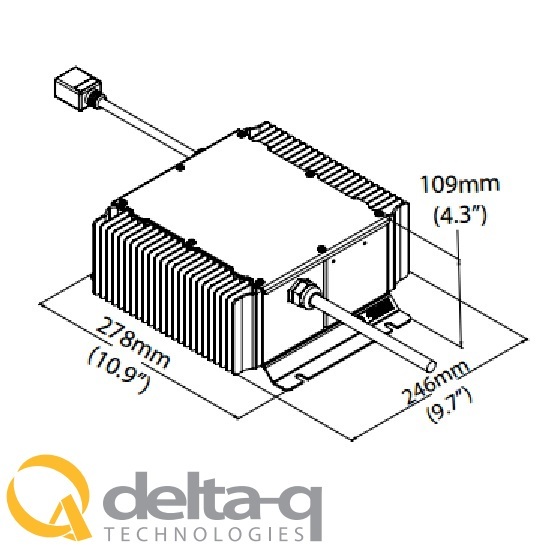 All Delta-Q QuiQ 72v battery chargers are produced at a Flex facility(formerly Flextronics) In the High Reliability Solutions division for assembling products with long service life and very low defect rate requirements. Proven, Efficient Design – A proven power electronics design with 93% energy efficiency and sealed enclosure to prevent damage from high vibration, extreme ambient temperatures, water, chemicals, and dust ingress. Charge Quality – Charge profiles to precisely charge deep-cycle lead acid and lithium batteries. Developed in Delta-Q’s battery lab to balance charge time, battery life and application requirements. Easy to Integrate – The QuiQ 1000 can be equipped to go on- or off-board, and is the same mechanical design as all other QuiQ series chargers. Clear display to indicate charging progress and completion. Uses battery maintenance tools for integrated charge cycle and event tracking. For Global Flexibility – Delta Q uses a Global AC input that can be used anywhere in the world. These products have stood up to the rigorous standards of worldwide testing and certification processes. Delta Q technologies has comprehensive regulatory approvals, including CEC energy efficiency standards. Be the first to review “Delta Q 72 volt Battery Charger 72v 12a 912-7200” Click here to cancel reply.